Are you ready to move on from Valentine’s Day? Your sweetheart forgot to give you flowers. Your chocolate soufflé fell flat. You ate too much chocolate. You drank too much wine. You don’t have a sweetheart. Etcetera. I’m not sorry to say goodbye to the whole rigmarole around the holiday designed to shore us up in the middle of winter. So I’m celebrating this weekend with this salad. Where I live, winter still stretches ahead, and while the privileged few can escape to warm beaches, the rest of us winter-weary folk must find solace on the plate. 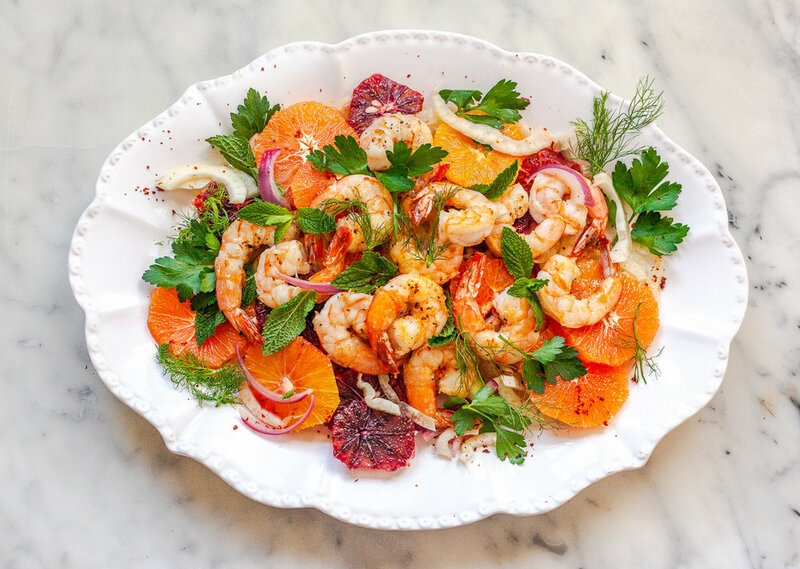 This fennel salad with pretty colors of Cara-Cara and blood oranges topped with pan grilled shrimp is crunchy, refreshing and a sight for sore eyes. Shrimp in the case at your market are labeled “previously frozen” and are defrosted at an indeterminate time. You’re much better off buying frozen unshelled shrimp with “IQF” (individually quick frozen) on the label. They’re flash frozen at the harvesting site and defrost quickly in a cold-water bath. Pink and white domestic frozen shrimp from the Gulf of Mexico are the best choice if you want to avoid imported shrimp, which have controversial harvesting practices. To peel a shrimp, grasp it by the tail. Start at the large end (where the head was), pull off the legs and outer shell together, and leave the tail segment attached and unpeeled. With a paring knife, make a shallow cut along the curved edge of the shrimp and tease out the mud vein with the tip of the knife. Peel the shrimp yourself or buy pre-peeled large shrimp, and this salad will be just the right antidote to winter doldrums. 1. In a small bowl, whisk the orange juice, lemon juice, vinegar, salt and pepper together. 1. Bring a kettle of water to a boil. In a large bowl, place the onion slices. Pour boiling water over them to cover, and let stand for 2 minutes. Drain in a colander and rinse under cold water. Return the onions to the bowl. 2. Add the fennel slices to the bowl and toss with half the dressing, salt and pepper. 3. With a serrated knife, trim the ends of each orange. Stand 1 orange flat side down on a cutting board. Using a sawing motion, curving with the shape of the orange, cut the pith and peel from top to bottom. Repeat all around the orange until it is peeled. Cut the orange into rounds. Repeat with the remaining oranges. 4. On a platter, arrange the fennel, onions and orange slices. 5. In a large, heavy-based skillet over medium-high heat, heat the oil. Add the shrimp and spread them to make one layer in the skillet. Cook for 1 minute. Turn and cook for 1 minute more, or until the shrimp are cooked through. 6. Arrange the shrimp over the salad. Distribute the parsley, mint leaves and fennel fronds on top. Drizzle with more dressing and sprinkle with Aleppo pepper. So I’m dashing this off to you, since there’s still time. Tonight or tomorrow to make these for your honey on Valentine’s Day. But if you don’t get to it, make ‘em anyway tomorrow. The hair of the dog, in chocolate speak. 3. In a separate bowl, whisk the flour, cocoa powder, baking soda and salt until blended. 8. Bake for 10 to 12 minutes, turning the tins from back to front halfway through baking, or until the tops are just done. Let the muffins cool in the pan for 10 minutes and transfer to a wire rack to cool completely. Bake the remaining batter in the same way, wiping out the muffins cups and adding more butter. 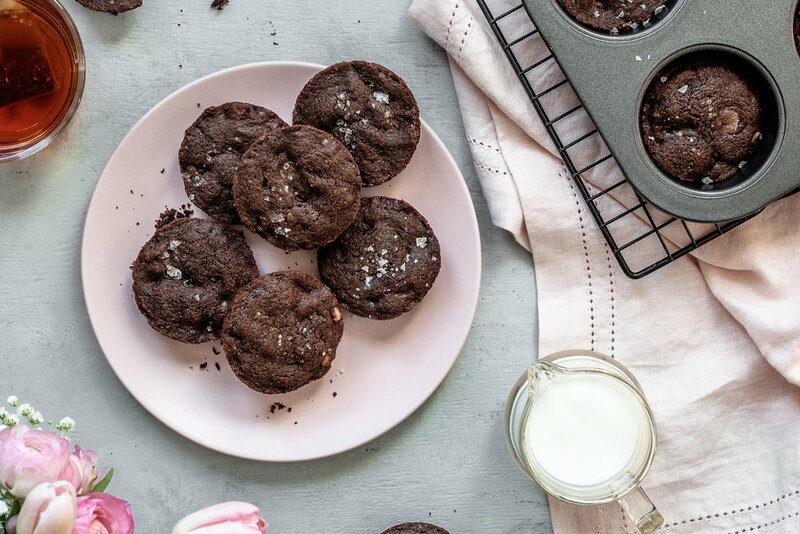 Store the brownie muffins in an airtight tin. By the end of January I am feeling it. Cabin fever. Winter weary. Longing for kinder, milder days. I don’t know how you are coping with winter. Maybe you embrace it and head for the slopes, relishing the thrill of racing downhill in the white, fluffy stuff. I wish I were you! I’m more of a sit-by-the-fire with a good book type of gal. Except, no fireplace, oops. This porridge helps. I made the mix to store in my cupboard and enjoy it on the cold days. In fact, I make a big pot of it, enough for several days, and keep it in the fridge for reheating in the microwave. (If you do that, be sure to add a little extra water or milk to the bowl when you reheat it since the porridge thickens in the refrigerator.) Having some frozen blueberries, or blueberry sauce on hand helps, too. You can make a sauce with frozen berries, too—I’ll get to that soon in the next few weeks. This recipe is a teaser for the Blueberry Cookbook I just finished, due to come out in August (Down East Press.) But you don’t have to wait that long to make this porridge—good for chilly days, winter or summer. Stay warm, friends! 1. 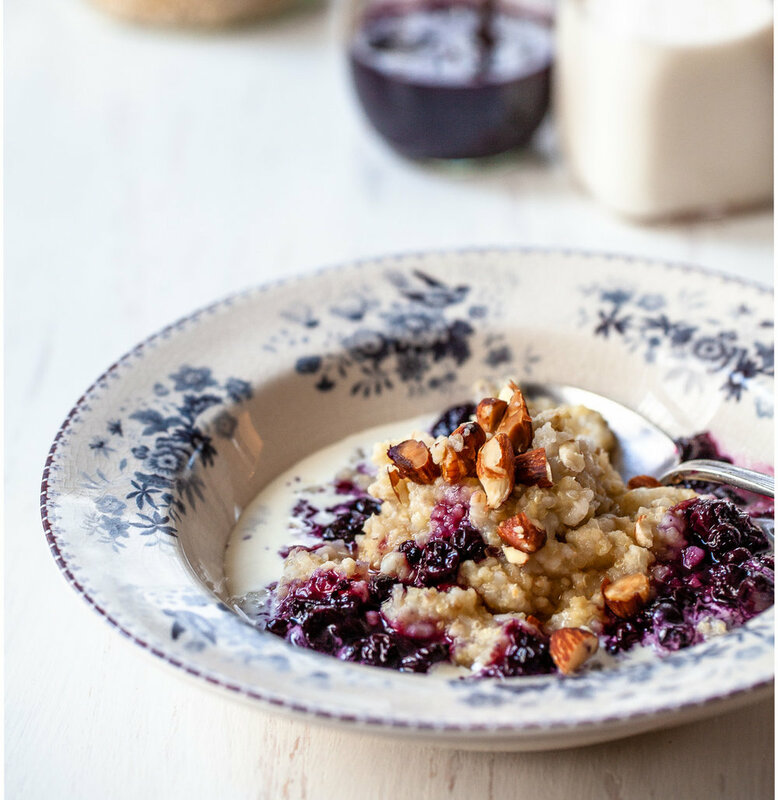 In a bowl, stir the oats, millet, quinoa, polenta and barley together. 2. Transfer to a jar and store in the cupboard until needed. 1. In a saucepan, bring the water to a boil. Add a pinch of salt and the porridge mix. 2. Adjust the heat to a simmer, and cook, uncovered, stirring occasionally to keep the bottom from scorching, for 20 to 25 minutes, or until thick. When the porridge starts to sputter, cover the pot and take it off the heat for 5 minutes. Grains that are stuck on the bottom of the pot will be released as the porridge sits and steams in the pot. Eat while hot, or refrigerate and reheat in the microwave. Serve with blueberry sauce and sprinkle with nuts, cinnamon and honey. If we have to pay for the sins of December excess in January, then at least let it be with something tasty. These burgers with chopped poblano peppers, onions, carrots and zucchini and beans are far from boring. Served with a refreshing pineapple salsa on lettuce cups, they are filling and appealing and you can feel smug that you kept to your new eating plan. The burgers can be wrapped in plastic and frozen in individual sandwich bags if you don’t plan to eat them all right away, so you can pull one out for a quick meal. Poblano peppers can range from mild to spicy, so taste a piece before you chop it if you don’t want a lot of heat; you can also substitute a bell pepper to avoid extra hotness if that’s your preference. You will use a food processor for all the chopping and there is no need to wash it in between tasks, so cleanup is at a minimum. Start by finely chopping the vegetables and softening them in a little oil in a skillet. Pulse a slice of bread to make soft breadcrumbs. The beans should be rinsed, drained and spread on a paper-towel lined baking sheet to dry to keep them from becoming a mushy puree in the processor. A few pulses are all you need to chop them coarsely. Once cooked lightly in oil, the burgers could be served on a bun, but there’s virtue in the lettuce cups, and the pineapple salsa will make you dream of the tropics despite the January chill. 1. In a bowl, stir together the pineapple, cucumber, poblano, onion or scallions and cilantro leaves. 2. Stir in the lime and salt. Taste and add more lime juice or salt, if you like. 1. In a food processor, pulse the poblano or green pepper, onion and carrot until finely chopped. Add the zucchini and pulse again to chop it. 4. Line a baking sheet with a paper towel and spread the rinsed and drained beans on top. Pat them dry with another paper towel to remove excess moisture. In the food processor (again, don’t bother to wash it), pulse the beans until they are in small pieces, but not pasty. Transfer to the bowl with the vegetables and breadcrumbs. 5. Stir the egg, salt and pepper into the bowl until well mixed. Shape into 6 patties. 6. In the skillet over medium heat, heat the remaining 2 tablespoons of oil. Add the patties and cook for 5 minutes on a side, or until browned and hot all the way through.